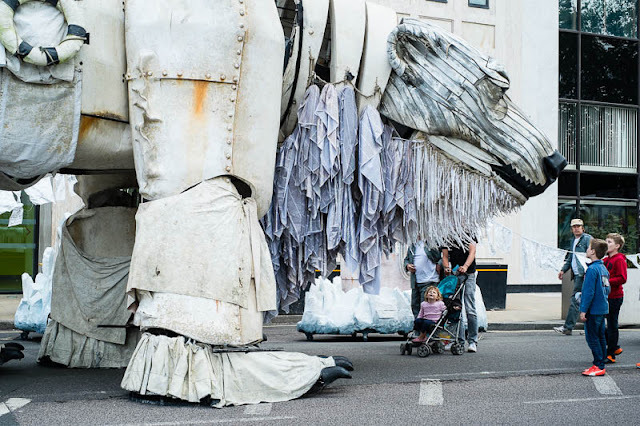 A giant polar bear, as big as a double-decker bus and with an almighty roar, loud enough to make you jump, is sitting outside Shell oil company's Southbank headquarters. What's it all about? Other than creating amusement for unsuspecting tourists wandering by. It is a Greenpeace protest about Shell's drilling in the Alaskan Arctic. Bloody amazing!! Hope it helps. Blimey! Hard to ignore, brilliant way to draw attention to cause. That is what I call good and interesting marketing. Been loving your recent blog posts. Inspiring me to get into central London more. Which of course Shell will completely ignore. That is marvelous. An effective symbol for the protest.